Tuesday 18th January 1916: A misjudgement on the part of a former soldier led to a tragic accident at the Britannia Iron Works this afternoon. John Wildman of 79, Marlborough Road, was recently discharged from the army after service at the Front as a sapper in the East Anglian Royal Engineers, and returned to his former employment at the Britannia Iron Works. He had brought a number of souvenirs hom with him from the trenches including a German shell which he took the the Works. It is not clear whether he simply intended to show it to his colleagues, or to attempt to dismantle it; whatever the original intention, the shell was fixed into a vice and operated on with a hack saw. Wildman had been under the impression that the fuse had been removed and the shell was harmless. Unfortunately he was mistaken and the shell exploded, killing Wildman himself instantly and fatally injuring three others, Donald Francis of Priory Street, a married man aged 26 with a three year old daughter, and two 16 year olds, Arthur Farmington of Eastville Road and George Trueman of Iddesleigh Road. 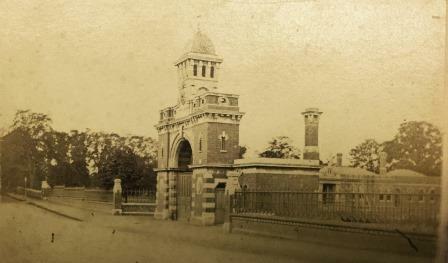 The men were taking to the County Hospital opposite the Works but died almost immediately. A fifth man, Herbert Papworth, was injured in the thigh but is expected to recover. It appears that Wildman was attempting to saw through the shell horizontally to get top and bottom sections; only a small portion of the nose survived the explosion.